63 seats for the UCP. 24 for the NDP. And a clear victory for Kenney’s party in the popular vote, with 55 per cent support to the NDP’s 32 per cent. That’s the tally with most polls reporting after Albertans, frustrated with the economy and the federal government, handed control of the province to the United Conservatives. Rachel Notley’s NDP government has come to an end after one term – a first in Alberta – with its seat count cut by more than half. In the short term, Kenney plans to cancel the provincial carbon tax and launch a legal challenge to the federal program. That will put him in the company of Ontario and Saskatchewan, which have taken Ottawa to the courts on the carbon measure. Women no longer need an ultrasound before receiving a prescription for Mifegymiso. Health Canada’s change is expected to be especially beneficial for those in small, rural or remote communities where ultrasounds can be difficult to access and wait times long. In Canada, the pill can only be prescribed during the first nine weeks of pregnancy. But ultrasounds aren’t the only way to measure this time frame; other means of dating a pregnancy include conducting a physical exam and asking if a woman knows the date of her last menstrual period. Until now, many women outside of urban centres have had to plan a trip to make an appointment for an ultrasound, waiting a week or more for an appointment, which could put them over nine-week limit. Last fall, our Atlantic bureau chief Jessica Leeder wrote about her trip from Nova Scotia to Toronto to get an ultrasound and an abortion, an experience that left her brimming with feelings of powerlessness, shame and disbelief. French President Emmanuel Macron is promising to restore the fire-damaged cathedral in five years, though most experts say it will likely take a decade. And despite its largely secular society, the country has come together to embrace the Roman Catholic landmark, which has become a symbol of 850 years of French history. “It’s devastating. 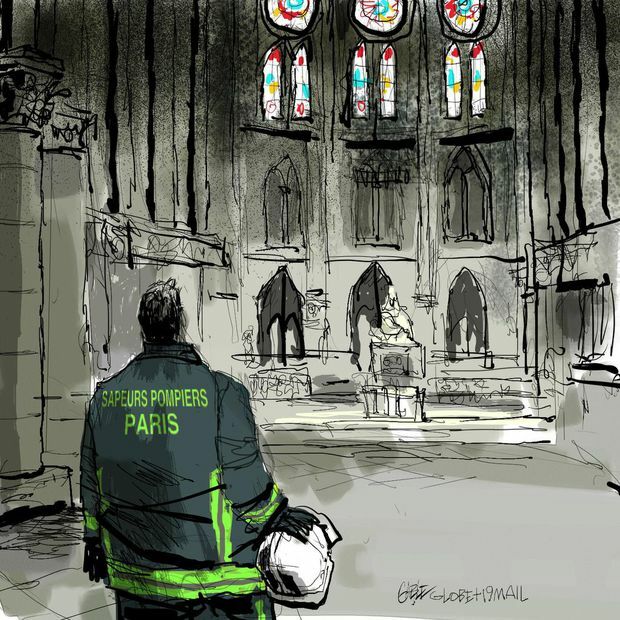 This is our soul,” Marie Hélène Dubreu told Globe correspondent Paul Waldie as she came to view the cathedral on the banks of the Seine River. A few metres away, two dozen university students sofly sang Ave Maria. Big contributions to the rebuild have come from French billionaires and corporations, including L’Oréal cosmetics, plus wealthy Americans such as Apple’s Tim Cook. Several online fundraising campaigns have also been launched. All campaigning for next month’s European parliamentary elections has been suspended in France as the country mourns the damage. Prosecutors have opened a preliminary criminal probe into the cause of the fire, but so far everything still points to it being accidental. The legal team for the suspended second-in-command of Canada’s military is questioning the federal government’s explanation for withholding documents and e-mails between senior staff in the Prime Minister’s Office. Norman’s team argued “the claims of solicitor-client privilege are over broad” considering PMO staff are not lawyers. One of the documents Norman’s lawyers are trying to obtain is a chart allegedly showing how government officials concluded that Norman passed cabinet secrets to Davie Shipyard. The Vice-Admiral has been charged for allegedly leaking documents to influence a $700-million federal contract. In other political news, the Federal Court has ordered another review of the Aga Khan’s vacation gift to Justin Trudeau. In 2017, the then-lobbying commissioner said there was no basis to a complaint that the billionaire philanthropist had violated the lobbyist code by allowing the Prime Minister and his family to stay on his private island in the Caribbean. But a judge now wants a second review, saying that even though there’s no evidence the Aga Khan was “remunerated” as director of a foundation, the commissioner must examine whether there was “anything of value” – not strictly monetary payment. Ontario Premier Doug Ford is telling teachers not to strike as the province and educators prepare for negotiations that could begin later this month. Contracts are due to expire at the end of August and tensions between the two sides have been on the rise as Ford vows to increase class sizes. The Peel District School Board has issued layoff notices to almost 200 high school teachers in part because of those class changes. Vancouver’s annual 4/20 protest is going ahead this weekend despite cannabis legalization and long-standing efforts to put an end to the unsanctioned gathering. The city refuses to give organizers permits, in part because smoking in parks is illegal. But the event has gone on anyway, with organizers this year saying the event is also about addressing stigma and criminalization. World stocks inched higher after a raft of Chinese data beat expectations on Wednesday and though benchmark bond yields and the Aussie dollar did the same, Europe struggled to join in. Tokyo’s Nikkei and the Shanghai Composite each gained 0.3 per cent, while Hong Kong’s Hang Seng dipped slightly. In Europe, London’s FTSE 100 was down 0.1 per cent by about 4:25 a.m. ET, with Germany’s DAX and the Paris CAC 40 each up 0.1 per cent. New York futures were up. The Canadian dollar was at about 75 U.S. cents. Eric Jardine: “Foreign Affairs Minister Chrystia Freeland made headlines recently when she proclaimed that foreign interference in Canada’s coming federal election was ‘very likely,' and that there had 'probably already been efforts by malign foreign actors to disrupt our democracy.’ Freeland is not wrong, nor is she being alarmist.” Eric Jardine is an assistant professor at Virginia Tech. Pedro Antunes: Given its demographic pressures, it is incumbent on Canada to identify how it can tackle the common barriers that impede the labour force participation of under-represented groups such as women, Indigenous peoples and persons with disabilities. Lifting labour force engagement among these under-represented groups is not impossible, although tackling this issue would require leadership and funding." Pedro Antunes is chief economist at the Conference Board of Canada. 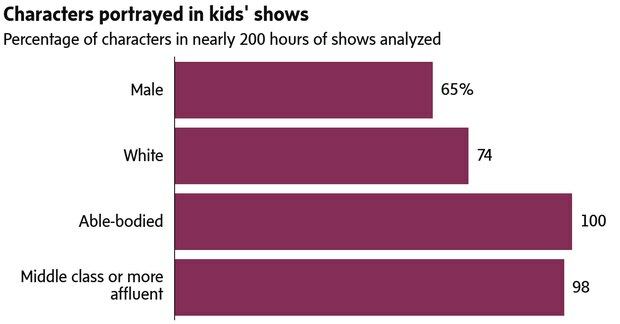 Just one-third of characters in kids’ shows are female, the exact same ratio as a similar study from a decade earlier. Almost none are shown with physical disabilities, nearly all appear to be at least middle class, and only a quarter racially diverse, the 2017 review found. The gap also exists off-screen, where most directors, creators and writers are male.